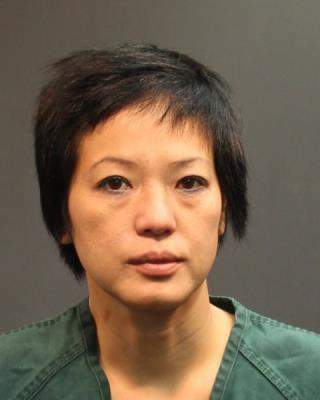 SANTA ANA, Calif. – A woman was charged today with vandalism and hate crimes against two Buddhist Temples in Orange County. “An attack on one religion is an attack on all. We must stand up to bigotry and respect everyone’s right to worship,” stated District Attorney Tony Rackauckas. The OC Human Relations Commission held its annual Hate Crime Network meeting and presented the Orange County Hate Crime Report for 2015. One of Supervisor Todd Spitzer’s Policy Advisors attended the meeting along with partner organizations, law enforcement and concerned residents for the annual Hate Crime Network meeting. (Orange County, CA)—The 2014 Orange County Hate Crime Report, published by the Orange County Human Relations Commission, shows reported hate crimes were down overall in 2014. Violent hate crimes, or crimes against people, were down slightly and crimes against property (vandalism) decreased as well. However, hate crimes that targeted African American, LGBTQ, and Jewish people remained the top offenses. “The injustice of a hate crime must not be counted as a single act against a single person, but must be recognized for the message of intolerance and intimidation it sends across a community of people”, said Commission Chair Ken Inouye. Santa Ana graffiti targeting Gov. 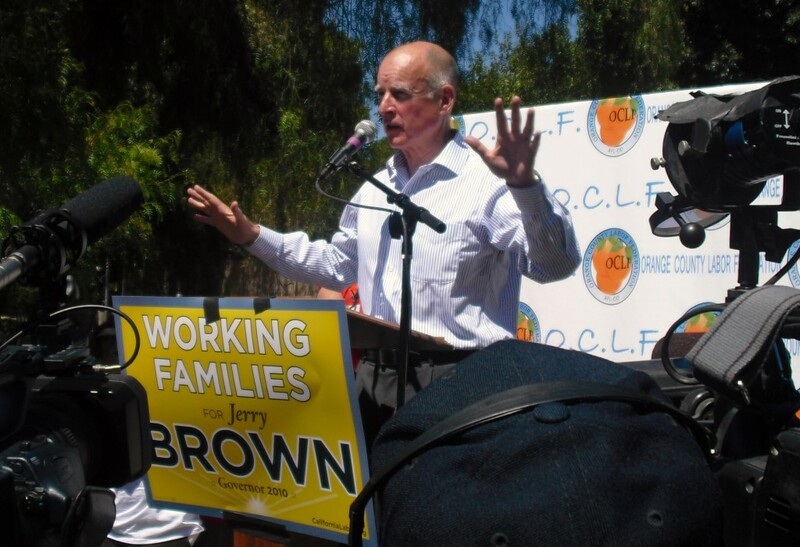 Brown underscores hate problem in the O.C. George Collins, a videographer who lives in south Santa Ana, and who ran for Mayor last year, was on the scene yesterday when graffiti was discovered on two walls in his area – but this was not normal tagging. 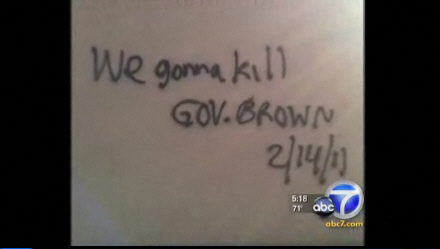 The words that were painted onto those walls constituted a threat to the life of our new Governor, Jerry Brown. Why target Brown? Who knows? He has been fairly moderate so far and has mostly made headlines for announcing that he is slashing public library funds and going after redevelopment and free enterprise zone funding. 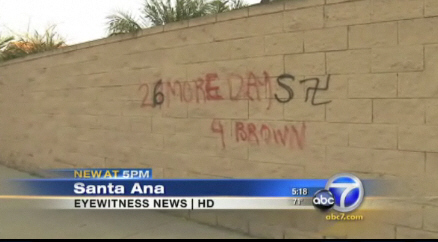 Brown appeared here locally, at the Santa Ana Zoo, at last year’s O.C. Labor Day event. He is a close friend of Santa Ana Mayor Miguel Pulido and Brown has actually stayed over at Pulido’s house while in town. Pulido told me last year that he met with Brown several times to assist with Brown’s campaign. The first one happened around Greenville Street just north of Alton Street, according to the OC Weekly, which also reported that the other graffiti threat appeared near Thornton Park. 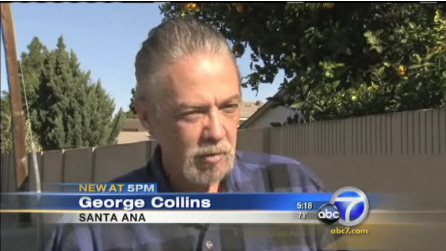 Collins appears in the video above, which I am providing courtesy of ABC News. They interviewed Collins and were able to video the graffiti before City of Santa Ana public works crews quickly painted it over. Collins noted on his Facebook page that the graffiti was covered up by 9:30 am. He credited the City of Santa Ana for acting quickly to get rid of these hateful messages. Cpl. Anthony Bertagna, of the SAPD, talked to ABC News and he brought up what happened recently in Tucson – and he noted that there have been other hateful graffiti messages in town recently – those messages have targeted gays, Catholics, Mexicans, African Americans and Asians. He also referenced that other cities in Orange County have been dealing with the same problem. ABC News cited at least eight such incidents, in four cities here in Orange County. Many of these messages have included spelling errors. I have noted over the years that right-wing anonymous commenters on local blogs often misspell words. The targeted cities have included Brea, Anaheim, and Irvine. Police in those cities are working together to identify if the taggers are the same person or are otherwise in cahoots with each other. One teenager I know who lives near the area targeted yesterday told me in a text message that there is a known skinhead who lives in that area. Young people in Santa Ana expressed fear yesterday, on Facebook. These are indeed scary times. Hate is commonplace on local blogs in particular. This is one of the reasons I suggested yesterday that we need to scan those who attend our local City Council meetings for weapons. 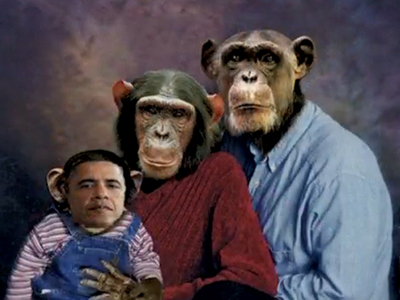 There are just too many unhinged people here in town and we need to take steps to ensure public safety. And the local Republican Party is part of the problem. Minuteman Lupe Moreno got appointed this Monday to the OC GOP Central Committee, as I related in a post yesterday. So did failed Santa Ana Mayoral candidate Charles Hart. 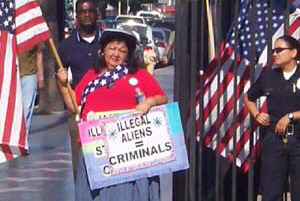 Moreno is well known for her hateful views targeting Mexicans and gays. Hart however is not much better. He pined during his campaign for the “good old days,” presumably when it was okay for city leaders to burn down Santa Ana’s Chinatown and segregate schools to keep Mexicans and African Americans away from white children. Another major problem has been the behavior of failed Santa Ana Mayoral candidate Alfredo Amezcua, who has been railing against the Santa Ana City Council and who has recruited a Who’s Who of bitter, angry folks to his coalition of people who mostly don’t live in Santa Ana. Their attacks on our City Council and our Mayor have been little more than innuendo and slander – contrast that behavior with that of the aforementioned George Collins, who recently met with Mayor Miguel Pulido to discuss concerns about the Harbor transit corridor and who continues to do good work in our community. Collins is a shining example of how politicians should act when they lose an election.